Ideal to give, fantastic to get! With the Gift Card you give someone a romantic, relaxing or pleasant experience. All Van der Valk Hotels & Restaurants, in the Netherlands, Belgium, Germany, France, Spain, Netherlands Antilles and USA accept the gift card, a fantastic gift to receive, ideal to give! Enjoy good food, sleep relaxed or enjoy. 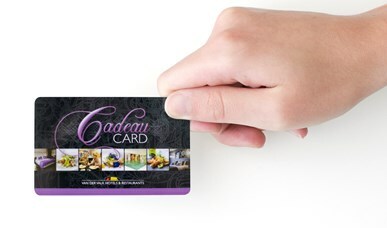 Pay for your stay at the hotel or restaurant with the gift card. You can also give a gift card for a special occasion as a gift. You can think of an overnight stay, but also a brunch or dinner. In addition, it is possible to buy a gift card that can only be spent on our hotel! Ask our reception for the possibilities. The Free Value Gift Card can be upgraded for any amount between € 5 and € 250. 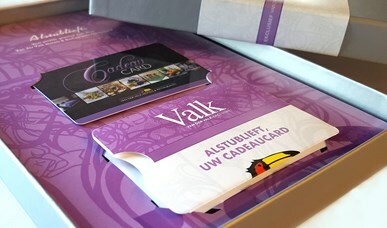 The Van der Valk Gift Cards are valid indefinitely and always exchangeable in every Van der Valk hotel and / or restaurant worldwide. With every order you can choose from a large number of extras to make your gift even more personal.